Writing as acting Confederate Secretary of War, Judah P. Benjamin denies Major General Braxton Bragg the possibility of a transfer to a more active post. Instead, Benjamin gives Bragg additional responsibilities, including defending Alabama. 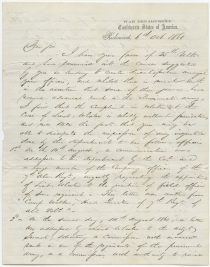 Bragg must have become tired of inaction, as three days after Benjamin wrote this letter, Bragg ordered the Confederate assault on Fort Pickens at the Battle of Santa Rosa Island. JUDAH P. BENJAMIN. [CIVIL WAR]. 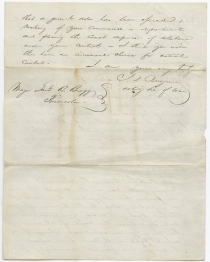 Autograph Letter Signed as acting Secretary of War, to Braxton Bragg. Richmond, Va., October 6, 1861. 4 pp., 7¾ x 10 in. On War Department letterhead. 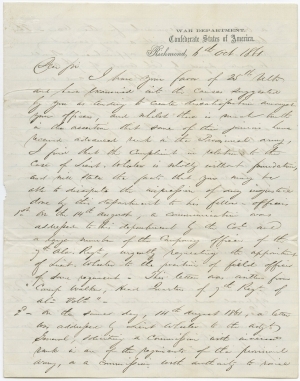 “I have your favor of 25th Ulto and have examined into the causes suggested by you as tending to create dissatisfaction amongst your officers, and whilst there is much truth in the assertion that some of your juniors have received advanced rank in the Provincial army, I find that this complaint in relation to the case of Lieut. Wheeler is wholly without foundation, and will state the facts that you may be able to dissipate the impression of any injustice done by the department to his fellow-officers. 2d on the same day, 14th August 1861, a letter was addressed by Lieut. Wheeler to the Adjt. General, soliciting a commission with increased rank as are of the regiments of the provisional army, or a commission with authority to raise a battalion or regiment for the War. This letter was endorsed with a very earnest recommendation that the appointment should be made, signed by Col Wood of the 7th Ala Regt., commanding 2d Brigade and was forwarded by yourself with a ‘full and cordial endorsement of Lt Wheeler’s application’ and it was, in consequence of these endorsements and recommendations, that my predecessor yielded to the solicitation of the officers of the 19th Ala Regt., and appointed Lieut. Wheeler their Colonel. I enclose you copies of the papers, as a duty to my predecessor, whose action on the subject is somewhat impugned by your letter of 25 Ulto. And now, my dear sir, having disposed of this matter, let me say, that the noble and self-sacrificing spirit displayed by yourself and the gallant spirits that are now chafing in the hateful inaction on the sands of Pensacola harbor, are fully appreciated, and elicit the most heart-felt approval and admiration, not only of the President [Jefferson Davis] but of every member of the administration. We are as anxious as you can possibly be to relieve you from a position to which the fortune of war has condemned you, and we look forward as impatiently as you can to some opportunity of testifying our sense of what is due to you all. But all our deliberation results in this, that to remove you, (as we know is your earnest desire,) to some field of more active operation, would have the most disastrous effect on the morale of the army under your command, whilst for your officers we can do nothing for the moment, under the legislation as it now exists; but we shall none the less hold them in remembrance for the marks of approval as soon as it shall be possible to transfer them to other fields of duty; and I will further say, that whenever you feel you can spare any of your officers and desire him rewards, I will find the means to place him in some desirable post and with increased rank in the provisional army. Santa Rosa Island blocked the mouth of Pensacola harbor, and the Union Fort Pickens effectively eliminated any strategic value of the Confederate capture of Pensacola’s naval shipyard and nearby railroad. Three weeks prior to this letter, Union forces raided the captured shipyard and burned the schooner Judah to prevent its putting to sea as a privateer. As evidenced in this letter, Confederate Major General Braxton Bragg was “chafing in the hateful inaction on the sands of Pensacola harbor” cut off from using his newfound assets to their fullest benefit. As Benjamin was writing this letter denying Bragg’s transfer request, Bragg himself must have been planning the retaliatory raid against Fort Pickens. The battle, which took place on October 9, 1861, was inconclusive, with both sides claiming victory in the Florida’s first land action of the war. Known as “the brains of the Confederacy,” Judah Benjamin (1811-1834) served in the Louisiana state legislature and U.S. Senate before joining Jefferson Davis’s cabinet first as Attorney General, then Secretary of War, and finally as Secretary of State. A New Orleans lawyer, Davis had given Benjamin the post of attorney general until deciding he needed him in a more important role. In September 1861 he was moved to the War Department. His closeness to Davis—and his Jewish faith—attracted resentment from jealous rivals. With the loss of Roanoke Island in 1862, along with Grant’s capture of Forts Henry and Donelson, critics demanded Benjamin’s blood. Davis responded by promoting him to Secretary of State, a post he held until the collapse of the Confederacy. Initially part of Davis’s contingent when the Confederate president fled Richmond in women’s clothing, Benjamin escaped to England where he thrived as a lawyer and was named to the Queen’s council. He retired in 1883. Braxton Bragg (1817-1876) was a career military officer first in the U.S. Army and later in the Confederate Army. He attained the rank of full General in the Confederate Army, one of only seven in the Confederacy. He fought at the Battles of Shiloh, Chickamauga, and Chattanooga, among others, and in 1864, became Jefferson Davis’s military adviser. Very good. Some separation at folds. One and one-quarter inch tear at the upper edge of page three. Minor paper loss along the main vertical fold. Areas light toning.